Forget juice cleanses and going paleo: There's just one diet you need to jump on, and it's... exactly what you're already doing. According to New York Magazine, the pros are increasingly recommending "intuitive eating" (or "mindful eating"), which lets you eat what you want, when you want it. The concept isn't new -- that term's been around since at least 1995 -- but it's apparently all the rage among nutritionists and psychologists nowadays. Researchers believe intuitive eating could curb binge-eating and help people keep off weight way more than fad diets, though studies surrounding the system remain small. 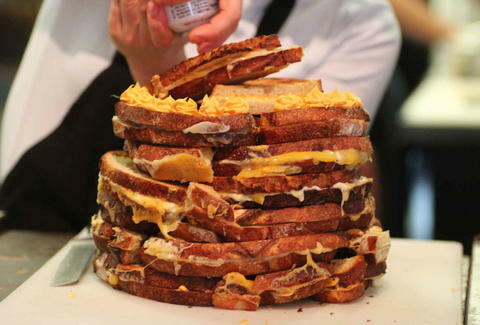 Intuitive eaters do, as the name would suggest, have to read when their body is hungry or full, which means pushing through grilled cheese cakes like the one above isn't really the idea. But it does let you eat pizza without shame, and that's one diet we can get behind. Kristin Hunt is a food/drink staff writer for Thrillist, and has been proudly eating "intuitively" her entire life. Follow her at @kristin_hunt.